I'm assuming that however the man breaks into the medical chain of evacuation there will be some scope for human error on the paperwork. Also, even after several decades of compulsory education, illiteracy rates were still significant amongst the men being drawn into the armed forces. So lots of scope for "garbage in, garbage out". Going back to the names on the list. Private 19/1839 E Tebay, West Yorkshire Regiment – at first glance it seems this is probably 15/1939 Ernest Tebay, West Yorkshire Regiment. His card is held at the National Archive under reference WO 372/19/186661. 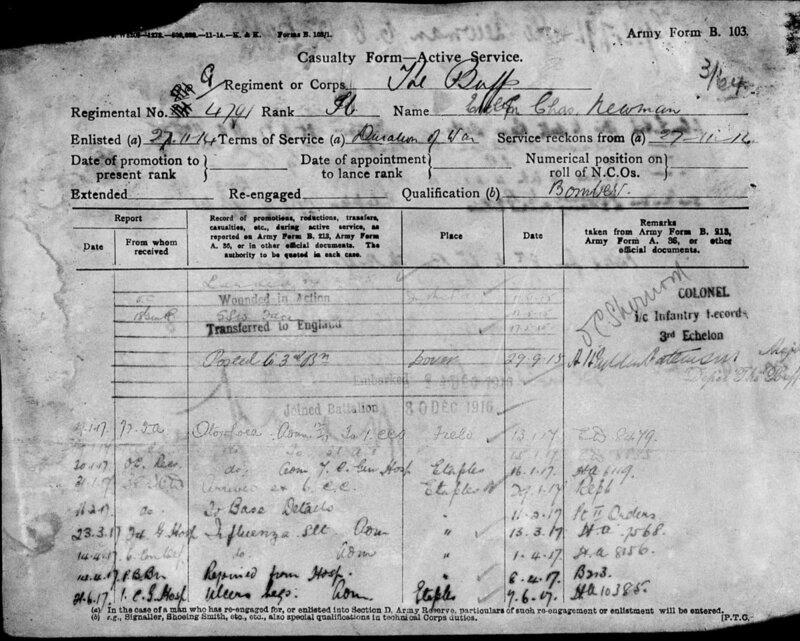 However the MiC says he was discharged medically unfit on the 29th December 1916. So unless either someone else used his name or the date on the MiC is incorrect then that would appear to rule him out. First landed in France on the 5th October 1915. He qualified for the 1915 Star, the Victory Medal and the British War Medal. 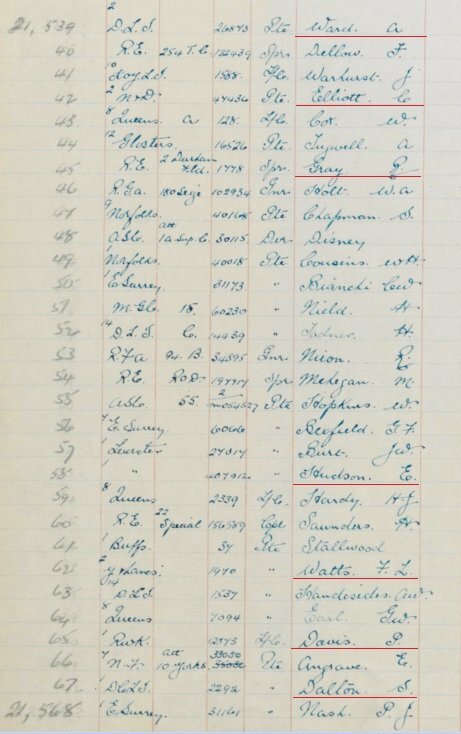 Private 6464 H E Roberts, London Regiment – may be a total co-incidence but there is a MiC held at the National Archive under reference number WO 372/17/24432 for a Private 6462 Hubert Roberts, The Queen’s Regiment who would also serve with the 19th Battalion London Regiment. The MiC gives no clues as to the order in which he served, not even which regiment issued his Victory Medal and British War Medal. My logic for considering him being that this man suffered gun shot injuries to his mouth and nose and so might have had trouble speaking. If he still had his old unit details on him, like an old I.D. 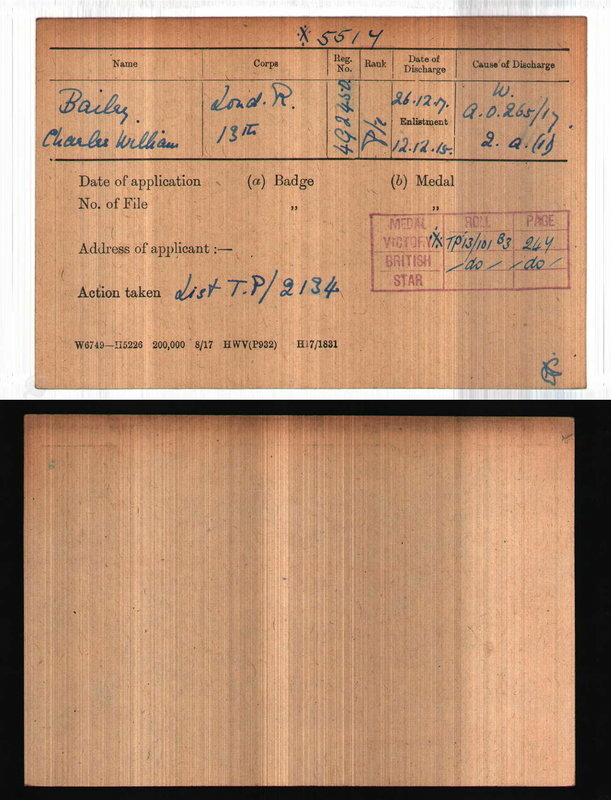 tag, or shoulder titles, depending on which way round he served with those regiments, then the two sets of details may have been conflated as the medical clerks searched for details of who he was. He first landed in France on the 14th October 1915 but that MiC only shows him being issued with the 1915 Star. His Victory Medal and British War Medal are on a separate MiC,WO 372/3/148364, but his rank then is shown as Gunner. Private 21035 W Watson, Warwickshire Regiment – possibly Private 21055 Walter Watson, Royal Warwickshire Regiment. 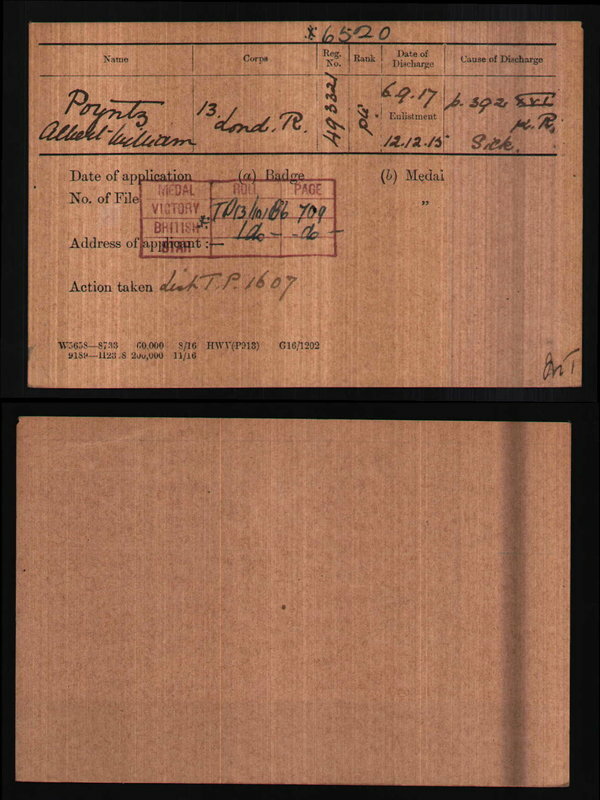 The catalogue entry for his MiC at the National Archive has him as “2105” Walter Watson and their preview scan attached to the catalogue shows a fifth digit that is lost into the blackening at the edge of the image. However via my free account on Ancestry I can see it is definitely 21055. He qualified for the Victory Medal and the British War Medal. 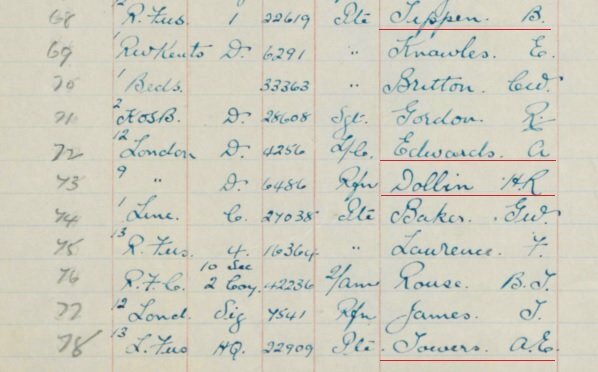 Private 4691 M Price, London Regiment - possibly 4691 Matthew Paice, 3rd London Regiment. He was also Private 265423 East Kent Regiment – the MiC does not give a clue as to which order or which regiment issued the medals. Private 6530 A Poyntz, London Regiment - probably the soldier whose MiC is shown as Private 493321 London Regiment in the name of Albert William Poyntz. Reference in the catalogue is WO 372/16/67667. His unit is shown as 13th London Regiment, he enlisted on the 12th December 1915 and was discharged on the 6th September 1917 as no longer physically fit for service. He qualified for the Victory Medal and the British War Medal. He was also issued with the Silver War Badge. The potential link to the man on the 31st Ambulance Train is on the card itself. Above the space for the Regimental Number is written “6520” preceded by a “X”. I believe the X relates to the fact that the medals were issued with this service number rather than the 493321 one. Poyntz is indexed on both the National Archive site and Ancestry with just the regimental number 493321. His unit is shown as 13th London Regiment, he enlisted on the 12th December 1915 and was discharged on the 26th December 1917 for a reason I don’t readily recognise. Again the link is what’s shown on the card. Above the space for the Regimental Number is written “5517” preceded by a “X”. While the National Archive only indexes him as 492450, Ancestry indexes him with both. He would go on to be Private 308377 Tank Corps. He qualified for the Victory Medal and the British War Medal which appear to have been issued by the Tank Corps. He also served with Regimental number 493753 in the same unit. Private 6275 H H Bullivant, London Regiment - one to consider is a Private Hubert H Bullivant who served in the 14th London Regiment before transferring to the R.A.F. The ony service number shown for his time with the London Regiment is 512456 but as his medals were issued by the RAF, service number 318460, they may not have shown earlier service numbers on his MiC. 512460 14th London had previously been 6280 14th London. (Murray Hamiliton). Given the way the renumbering has been applied in the 14th Battalion I would have to say that Hubert Bullivant has to be a serious contender for the man on the train. Rifleman 4637 G Stiles, London Regiment . Worth considering is Private George E Stiles whose actual Medal Index Card shows him as 9th London Regiment. Although he is shown as service number 391630, his medals were actually issued by the Labour Corps, with whom he was Private 575661. As this was only a MiC, the clerks preparing the MiC’s might not have been that bothered about earlier service numbers. Private 5752 W Daniels, London Regiment. Possibly Private 5751 William S.J. Daniel, 14th London Regiment. He subsequently served with the Labour Corps as Private 353001. Private 1644 P Mahoney, London Regiment. Worth considering is Private Patrick Mahoney whose actual Medal Index Card shows him as 1st London Regiment. Although he is shown as service number 200236, his medals were actually issued by the Labour Corps, with whom he was Private 665837. As that looks like a Territorial Force renumbering range for his service with the London Regiment and this was only a MiC, the clerks preparing the MiC’s might not have been that bothered about earlier service numbers. He also served with the Royal Defence Corps but it’s unclear from the MiC in what order and which issued his medals. Lance Corporal 4256 A. Edwards, London Regiment (12th) – one to consider is Corporal Ailwyn Lewis Edwards, 12th London Regiment. Although his card shows his regimental number as 471502, his medals were issued by the Labour Corps with whom he served as 586875. He qualified for the Victory Medal and the British War Medal and was also issued with the Silver War Badge. I took a quick look at the surrounding London Regiment numbers to see if there was a consistant renumbering. Rifleman 6486 H R Dolbin, London Regiment (9th) – probably Private 6489 Henry R. Dollin, 9th London Regiment, later renumbered 39271 in the same unit. Private 9787 A. Jackson, Trench Mortar Battery (possibly ex Leicesters) – Private 9787 Albert Jackson, Leicestershire Regiment does seem to be the best match. 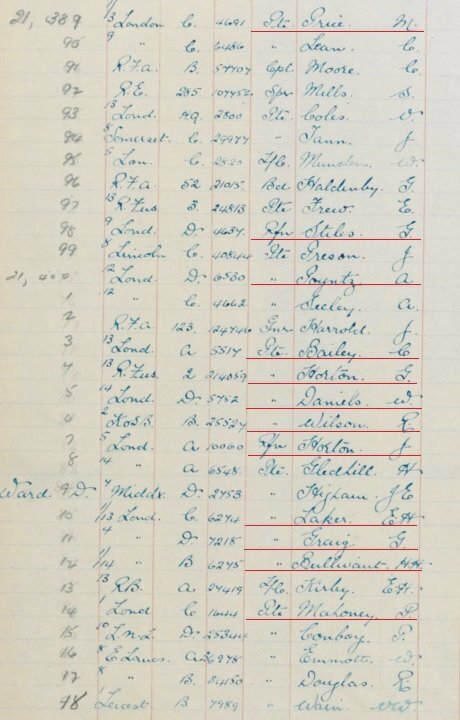 Ancestry has Pension Records in the name of Henri Stanhope Millor Thompson which might be the same man and so might resolve the Regimental number issue. 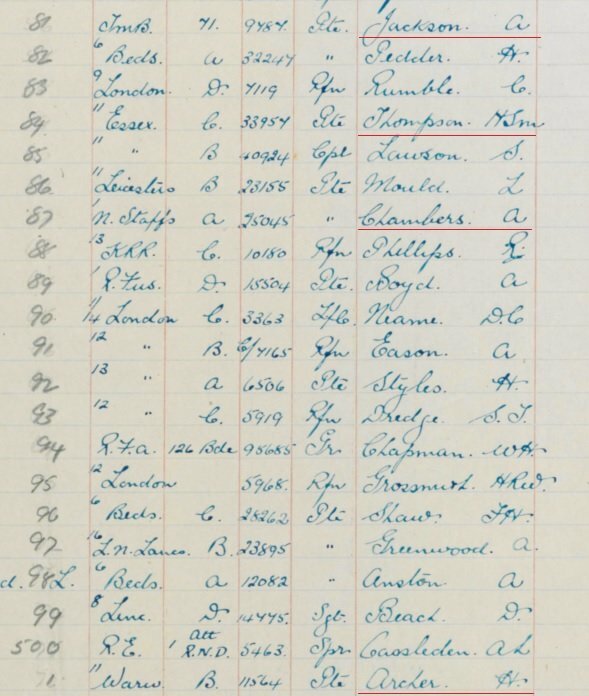 The familysearch website has a record for a Henri Stanhope Mellor Thompson who was 33956, 3rd Battalion Essex Regiment. They also have another record for him as 33957 11th Battalion, Essex Regiment. Do you know the route the train took? I have noted some 56th Div men and know they were in the Laventie area in Jan 1917. First entered a Theatre of War on the 11th September 1914 so qualified for the 1914 Star as well as the Victory Medal and the British War Medal, plus he was issued with the Silver War Badge. Looks like he may have been originally with the 38th Brigade, RFA. Also came across this earlier. First of an occasional series called "What happened next". While I can't prove that the other names on page 1 that entrained from the same location and detrained at the same location came through the same medical facitliies, it would be a reasonable working hypothesis. It also puts a different slant on what actually constituted a 'blighty' ! (WRCCS - I believe that's the West Riding Casualty Clearing Station). Dates match - I'm intending to add a comment in the notes column if there is any discrepancy. 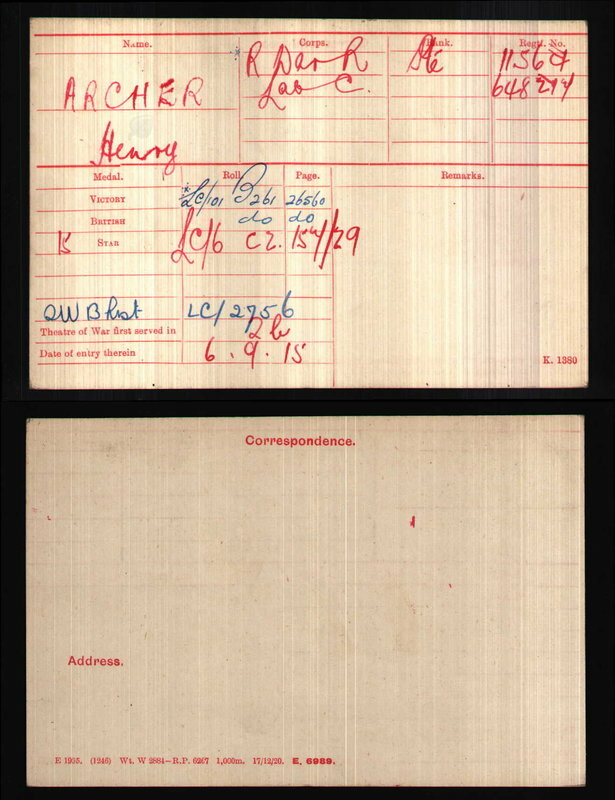 Thus for Henry Edward Thurley his Casualty Form Active Service shows a move from the WRCCS to 31 Ambulance Train on the 15th January 1917 and on the 16th he is reported at 1 Canadian General Hospital, Etaples. 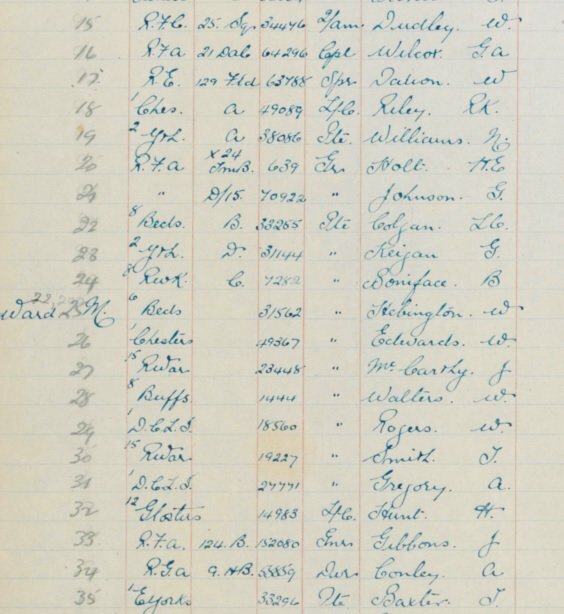 The equivalent page for Evelyn Charles Newman, (sourced FindMyPast), is attached. It's just about possible to make out his progression through the medical evacuation chain for this period, but the dates all seem to tie up.